Supported By: SOSCIP, FedDev, OCE, IBM Canada Ltd.
A Kitchener-based start-up and a research team at the University of Waterloo are using artificial intelligence (AI) to empower cities around the world to travel smarter and more efficiently. Prof. Alexander Wong from the University of Waterloo is collaborating with Miovision, a traffic management company, to build the first affordable, low-powered, energy efficient, real-time traffic event detection system. Miovision, which delivers cloud-based technology to intersections, was founded in 2005 by three friends and classmates at the University of Waterloo. The company built and launched the Video Collection Unit (VCU) and introduced video online processing technology as a more accurate and affordable solution to manually counting the various movements of vehicles passing through intersections (also known as Turning Movement Counts or TMC). Miovision processes millions of hours of video data for more than 1000 customers in over 50 countries. Together, with SOSCIP researcher and University of Waterloo Professor, Alexander Wong, they aim to revolutionize traffic management even further by harnessing SOSCIP’s advanced computing tools. 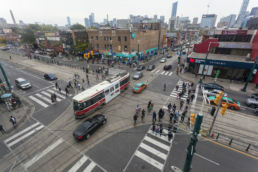 The real-time traffic event detection system will not only significantly improve traffic conditions in congested city intersections such as those in Toronto, but will make them safer and more environmentally-friendly. Prof. Wong, a Canada Research Chair in Medical Imaging Systems and co-director of the Vision and Image Processing Research Group, and Miovision are using the SOSCIP Large Memory System and the GPU Platform to create a scalable artificial intelligence (AI) device that is efficient at processing thousands of hours of video data, making it suitable for low-powered and real-time computation. “How do you get powerful AI computing devices into intersections?” asked Prof. Wong of the Systems Design Engineering Department at the University of Waterloo. “That’s the challenge – putting small, inexpensive, low-energy devices in intersections that require less bandwidth and less computing power. “Our preliminary tests using the SOSCIP GPU platform showed that Miovision’s models can be trained almost five times faster than on a Titan X GPU,” said Prof. Wong. To train the model on a Titan X GPU in Miovision’s training platform, the original network is complex and requires approximately 12 hours to train over a small database of 1300 frame samples for 50 epochs, and almost five days to train the model over 10 generations in the evolutionary framework, developed in the Vision and Image Processing Research Group. Using a more comprehensive dataset of 60,000 frames the non-optimized deep neural network requires approximately 10 hours for each epoch of training on a Titan X GPU. “Our findings on the GPU clusters indicate that the approximate time saving for training the original deep neural network over 10 generations, with 50 epoch per generation, is four days for the small dataset. Also, using the SOSCIP GPU platform makes it feasible to train the [optimized and reduced] model over large datasets of vehicles and objects,” explained Prof. Wong. As one of the few teams of researchers in the world skilled in Edge AI computing, Prof. Wong believes that AI will play an important part in everyday life. “AI opens the door to all sorts of applications – It’s limitless and can process accurately the necessary information required for AI analytics. There are a lot of real world, practical and operational problems that can leverage this type of AI,” he admitted. Miovision is moving in the right direction. In addition to meeting major project milestones, the company recently moved to Catalyst137, a 475,000 sq. ft warehouse that is poised to become a IoT hub. Catalyst137 is the shared vision of Kurtis McBride of Miovision and Frank Voisin of the real estate investment firm Voisin Capital.